I'm going to have trouble writing this post, because I'm watching the film 'Nativity', and it is cracking me up. So quickly here we go. I had to work tonight, so thankfully our activity was an easy one today. 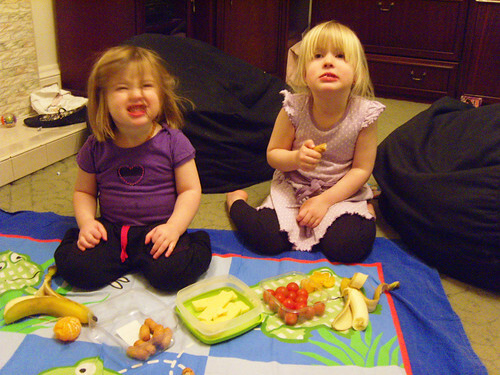 Have a picnic on the floor in our pajamas. So before I left for work, I helped the girls put down a blanket, change into their jammies and pretty much just pulled random things out of the fridge for them to eat on the floor. 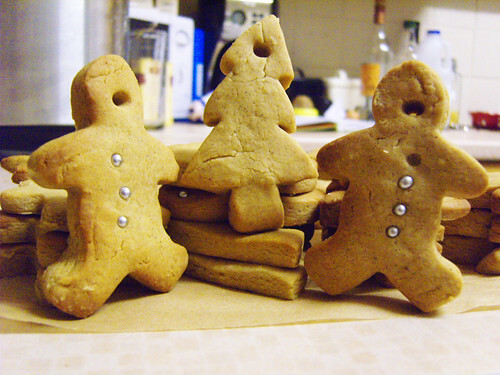 Plus, we finally got around to making those gingerbread men. Though most of them are not men, but Christmas trees, stars, hearts, bells and birds. 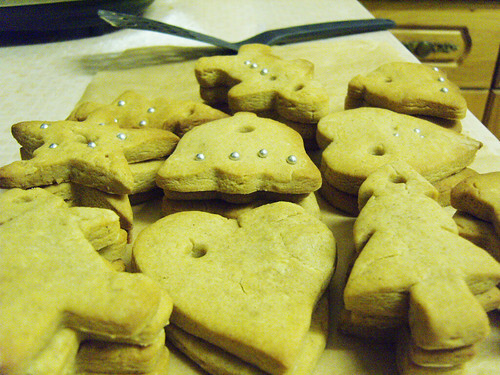 Once those kids saw me pull the cookie cutters out, I had a hard time whittling them down to just Christmas shapes at least. One of the things I find more difficult than anything in the world is baking with kids. Baking is practically an art form to me, (yes, I realise how ridiculous that just sounded) and having the kids involved, and therefore, ruining what could be a beautiful piece of work, KILLS me. So I had to really control myself when they kept trying to cut shapes halfway off the side of the dough, or squish the freshly cut pieces, or shove a different cutter through an already cut piece. Or smoosh the silver balls right through the dough. Gah. Anyway, we managed to get through it (though with more frustration than I'd care to admit), and we now have some lovely cookies to hang on the tree! "Yes, darling, I think THIS is The Tree."